After Arena was gone, there was an empty spot in my room that needed to be filled, and that was the point where the collecting started. What kind of pinball machine would be second? A dot-matrix display WPC game? One of the great end-80s/start-90s games? Or maybe and older game? 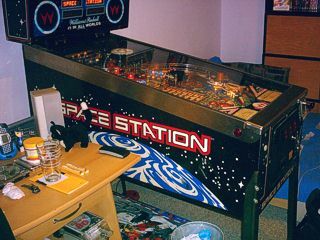 I found my answer when I looked through a list of all pinball games Williams and Bally created from 1980 till 1999, in the IPDB. I was always convinced that WPC games from the 90s were more suitable for me since they have better technology, more features and especially more rules for greater replay value. 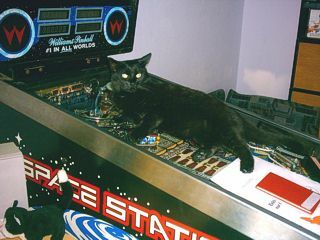 Being used to pinball simulations on the PC, I wanted all those features on my real machines too, and The Machine was a good start at it with a challenging playfield, a main goal and several scoring opportunities bet-ween. Many older machines don't have so many features or they lack an ultimate goal to work on. However, when I studied the WPC games in the IPDB, I found that only a few of them would be my taste. I've already played some of them in reality, e.g. Star Trek TNG, Terminator 2 (which is now mine) and Tales of the Arabian Nights, so I think I can judge which WPC games are for me, and there are only three or four of which not all are available for sale, and payable by a 20-year-old with currently 350 Euros per month to spend. What I noticed was that a lot of themes and designs used in the older machines from the 80s looked a lot better than all the comic and film themes from the 90s WPC games. I marked several of these old games and put them into my list of wanted machines. I knew that getting an older game would probably mean that its replayability was limited because of less features. However, I had played Peter's old machines in his basement and got an impression of what old-school pinball was really like. All those machines from earlier times have a classic, player-near feeling, and you notice all the mechanics and "man-made" stuff on the playfield. The old games simply have a cool atmosphere that can make you come back for more if the machine itself is cool enough and not too repititive. A few games that were interesting to me from that time are Xenon (instant classic anyway), Space Shuttle, Space Station, Road Kings (not anymore) and later Pin*Bot, which I got after Space Station. A lot of these tables have a space theme. I like space. In fact, I love every-thing about it. It's not a hobby of mine to watch stars, but every new techno-logical aspect of space exploration has me listening attentively. I also played a lot of PC games that were set in space in the good old DOS and Windows 95 days, starting with the Descent series and going over to classic shoot-em-ups and futuristic racing games. Space in games fits well and so my eye was especially on the two space pins, Shuttle and Station. 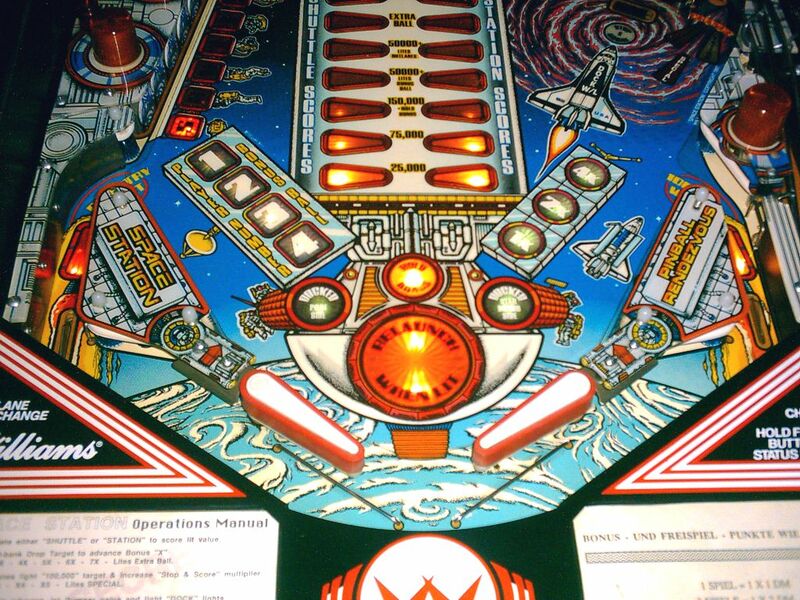 I tried both out in Visual Pinball and found that the Shuttle had a very classic value and would probably be one of those old-school feeling machines that I'd like to have. However, Shuttles are rare and seldom for sale. As luck would have it, once I got Pin* Bot later, three Shuttles emerged from their caves and were sold on eBay and in the Pinball Network forum. Oh well, sometimes waiting would be better... However, I was a bit more sure about the Station since the playfield had quite some things on it, the design with all the shuttles and ships floating in blue and black areas looked very cool, and especialy sound and music were so undoubtedly spacey that I was very interested in trying this thing out in reality. At least in VP it was very enjoyable and I found myself playing a long time every day. And as luck came to me in the right moment this time, there was a Station hidden away on eBay, about 400 kilometers from here. There was somebody else in the forum who was interested in getting it, so it was a little battle. Nevertheless I won and got this Station for exactly 200, which is very low for a limited machine like this. The female seller was cooperative enough to agree on shipping instead of picking up (distance was just too much) and the same boy from the forum who had sent me the F-14 insert stickers and spinner con-tacted me with a cheap shipping offer (thanks again, Mario), so a week later I had the Station in my room where Arena stood before. Unpacking a shipped pinball machine is a little different from picking it up and assembling it at home. For one, you have to get rid of all the plastic film around it, then the belts and the carton cushioning. It takes quite some time and a second pair of hands (Elias was around when it arrived) and then you have to attach the legs and move it into position. However, it is very nice to unpack a new machine since you see more and more of the thing as you go, a little like Christmas. The backbox was completely wired, so there were no other assembly steps necessary. As I said, space is ultimately displayed in this game. The greatest part is the audio, with the mission control speech samples, the electronic-sounding sound effects, and the beautiful medium-paced music which is really a class of its own and sounds a lot like old DOS game titles with FM MIDI music (yes, a little like Descent if you ask me). I miss the Station for the audio and when-ever I fire it up in Visual Pinball, I have a little flashback to the real thing which is now gone (more on the reasons later). The theme is also carried by the gameplay which involves "docking" (locking) balls and then having a redocking multiball where the general illumination switches from normal white to green! To achieve this, the GI is doubled on the Station with a green lamp next to each white lamp which makes for a total of double the normal amount of GI lamps. It looks cool when you play in the dark and the green lamps dampen the playfield into a mildly-lit "alarm" green fog. 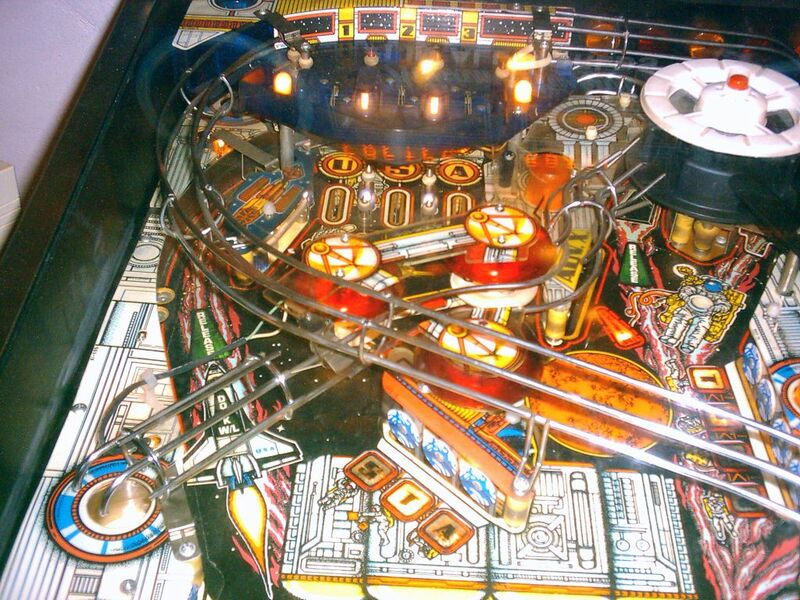 It surely raises the drama in multiball. 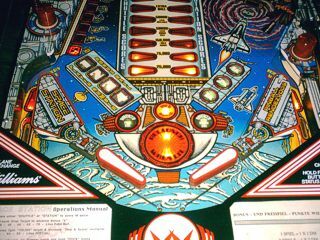 Also, the white spaceship-like plastics, the orange-coloured flasher tops, the blue-to-black fade of the playfield colouring and all the bright insert lights which accompany the ships and astronauts on the playfield all add to the theme nicely. The first thing you notice about Space Station are the slingshots. Those are integrated into the lane plastics next to the flippers and thus this game has no inlanes, making it difficult to catch the ball with an upheld flipper like you nor-mally do to stop the ball and aim for an accurate shot. 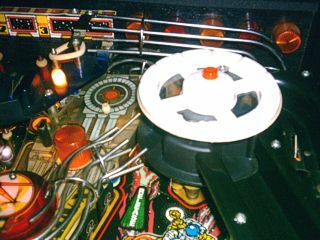 It's difficult because the slingshot rubbers start only slightly next to the flippers and so the ball is often kicked back up onto the playfield before you can catch it. This and the rather horizontal positioning of the slings, which kicks the ball far up into the center, give the game a kind of low gravity feeling, perfectly fit to the theme. Space Station also has a lot of standup target banks and a bank of three drop targets which are rather hard to hit and increase the bonus multiplyer. There is also a mini playfield at the top that can be accessed when shooting the ball into play and when hitting a ball popper. There are two lane changes, one on this mini playfield and the other as usual above the bumpers. I think they activate and change the locks, but I'm not sure about this anymore. The big seven-target bank to the left spells S-H-U-T-T-L-E for the randomized Shuttle award (as seen on the center) and the other two three-target banks spell S-T-A-T-I-O-N for the randomized Station award (seen on the center as well). Then there is the ramp on the right which is just another way to access the ball poppers for the locks, but it's very difficult to hit since it's so far on the right and protected by a timed drop target for Stop & Score, a time-limited feature where you score the currently displayed value when you hit the ramp. The locks are quite spectacular. 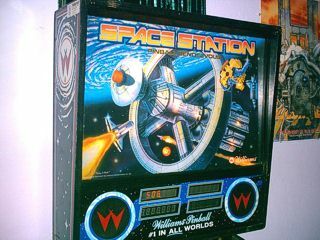 The ball goes into a ball popper, the space station plastic model on the top right rotates to divert the ball to the correct lock and the popper launches the ball into that lock under sound and flashing lights. Once two balls are locked, the third ball can release them and the redock multiball starts under green illumination. Getting the Rescue Jackpot is the goal and can be repeated as long as at least two balls are in play. Finally, if you manage to get Bonus Ball, you can play either 20 or 45 seconds at the end of the last ball with an "undrainable" ball that comes back to the plunger when lost and is only defeated by the time limit. Space Station plays a little awkward to many people and I include myself among them. That's also why I gave it away after a month. I thought the theme and the fluent gameplay from Visual Pinball would be too great in reality to not keep the machine, but in reality it was all different. For one, the game was not fast enough for me. My personal thumb rule for older games is, if it doesn't have many rules and features to play for, it must at least give you a speed rush so that the action makes you come back. The Station didn't have this from the beginning. I have played other games that had me going "WOW!" from the start, but the Station didn't do this. In fact, I didn't feel much excitement when I first played it. Maintenance was due to make it faster and I did clean the whole playfield in a two-day process, exchanged rubbers and all that stuff. I also had a big drama with the fuses inside the backbox since two of them blew when I tested the solenoids, one of them being the bumpers and the other being the right flipper. Getting new fuses and installing them correctly was an adventure to me since I was new to this and the forum helped me a lot with this even though they had to cope with my bitching. Finally, everything worked again except for the fourth display which was dead from the beginning, probably outgased and needed a replacement. Displays cost a lot though and I didn't have time to exchange it anyway before I gave the machine away. Last but not least, I didn't get into the backbox to change fuses since the key for the lock was missing. Elias and I decided to break it open after countless tries of doing it the "usual" way, and that left a nice mark on the right side of the backbox and got some good laughs (and evil looks) from the forum. Still, what bugged me about even the restored Station were the weak flippers. They didn't even get the ball up the ramp most of the time. I tried to file down the contact plates of the EOS switches to get rid of electrical resistance; this was what Peter had told me to do after he got my F-14. 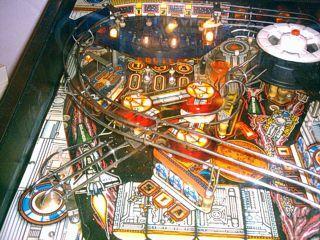 It didn't help much though and since the flipper assemblies were almost new, they must have been replaced some-time and the blank orange coils looked as if they were not Williams originals. Thus, I lead the weakness back to those coils and gave up. But that's not the main reason why I gave it away. In fact, the whole game didn't amaze me as much as on the computer. 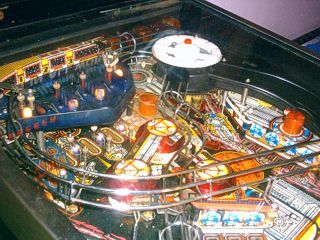 The tone of the well-mylared playfield was a little yellowish and gave all plastics and the black and white part in the upper half a too warm tone which distracted from the pure cold space look it had on Visual Pinball. Plus, the GI was yellow instead of bright white which is probably due to old lamps and wires since The Machine's GI is completely white (and looks very spacey as a result). So the whole look & feel were somehow not 100% of what I had expected and I loved the atmosphere of my expectation. The audio still gave it the full feeling, though, and as I said, I miss that part of the game. The second main point of giving it away was the gameplay. As I mentioned, it plays awkward to me with all the devices being quite "in the way", specifi-cally the bumpers in the center and the ramp too far on the right. The play-field does not have a good flow and the ball goes up and comes down in strange ways. It's hard to describe, but I found the right flow in the very first game with my Terminator 2, to give an example. So, the Station actually stood around for a long time before I cried out to the forum for an offer of exchange. I still wanted a classic pinball game since I had found the taste for that, and what did I get? Peter again contacted me offering his Pin*Bot, the predecessor of The Machine, from 1986. I had played it in his basement next to The Machine, but I didn't find it very delicious at the time since it couldn't stand a chance to the Machine hype. However, since Peter's offer was the only good I got, I was willing to try Pin*Bot on Visual Pinball (in a bad simulation) to find out whether it could raise the fun level after longer playing. It took me a day or two to find it out, but now that I wanted an older game, Pin*Bot really seemed to be a lot of fun and Peter met up with me for a test, just like two months earlier. He liked the Station and we did the exchange. Days later he reported that he got the flippers powerful again by filing the contact plates! I was starting to seriously doubt my tuning skills, but he had told me the exact way he does it with sand paper, so the next time I need to tune up flippers, I will try this method. He likes the Station very much and it was a good exchange to him since he was tired of Pin*Bot. 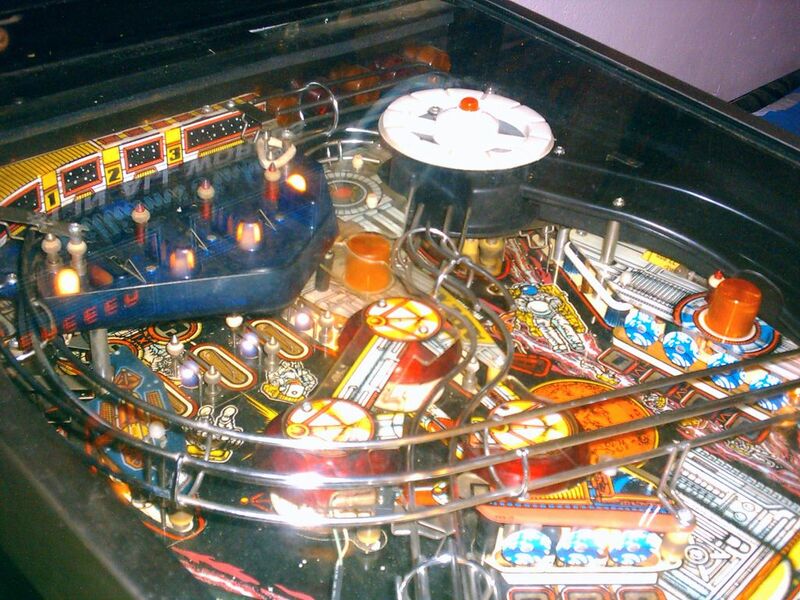 Check out the Internet Pinball Database for media on this game. If you want to try Space Station on Visual Pinball, get the table from VPForums (registration required).